On October 5-9 our Riverbed team will demonstrate its IT performance leadership at the Gartner Symposium ITxpo 2014 at the Walt Disney Dolphin Hotel in Orlando, Florida. Gartner Symposium ITxpo is an impressive gathering of CIOs and senior IT executives. This year’s agenda offers 500+ analyst sessions, workshops, roundtables, and mastermind keynotes across five full days. We’re excited! The theme for this year’s event is all about ‘Driving Digital Business’. Attendees who stop by our Riverbed booth (#948) will learn about the company’s IT performance solutions, which have been selected by more than 25,000 organizations to help consolidate IT infrastructure and reduce costs while increasing employee collaboration and productivity. Riverbed offers the most complete platform for Location-Independent Computing that ensures applications perform as expected, data is always available when needed and performance issues are detected and fixed before end users even notice. This solution includes: SteelHead, SteelFusion, and SteelCentral. On October 8 at 1:30 EST, David Giambruno, Chief Information Officer with the newly formed Tribune Media Company will share his tips, tricks, and lessons in a special speaking engagement titled ‘Confessions of a Turn-Around CIO’ on how Riverbed technologies helped accelerate his company’s move to private and hybrid clouds. 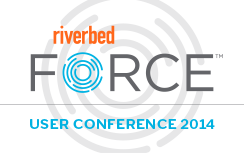 And speaking of events, don’t forget to sign up for Riverbed Force, our upcoming user conference taking place the beginning of November.